I should probably thank my civil war ancestor, Samuel Stillman Glover, Jr for his tenacity in filing for increases to his pension. Each request for a pension increase left a paper trail. I recently received copies of Samuel's file after ordering it from the National Archives and Records Administration. I received a .pdf file, with 91 pages on a CD, forty days after requesting it. The pages I have found the most interesting are pages written from his captain, Marcus Grant, detailing his service and injury; pages confirming the death of Samuel and his wife, Adda; and a page that Samuel himself filled out with details on his family. Check back in the future as I share the pages of Samuel's pension file. 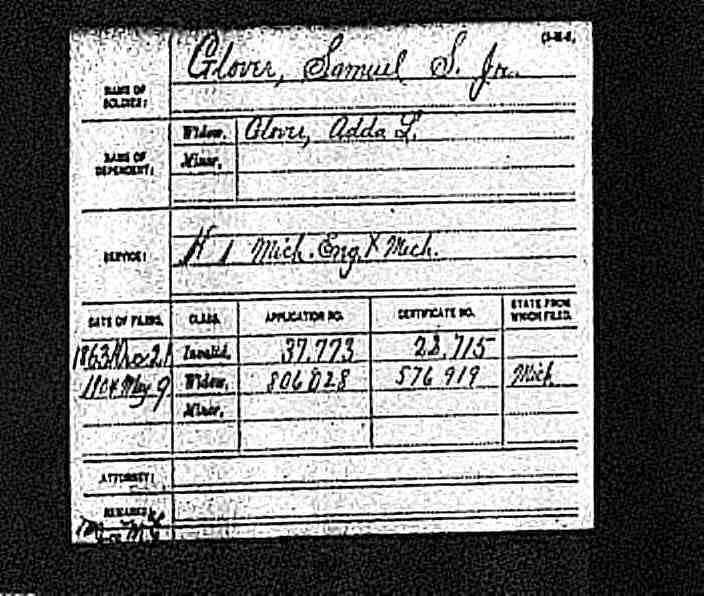 Ancestor Biography: Samuel Stillman Glover, Jr. 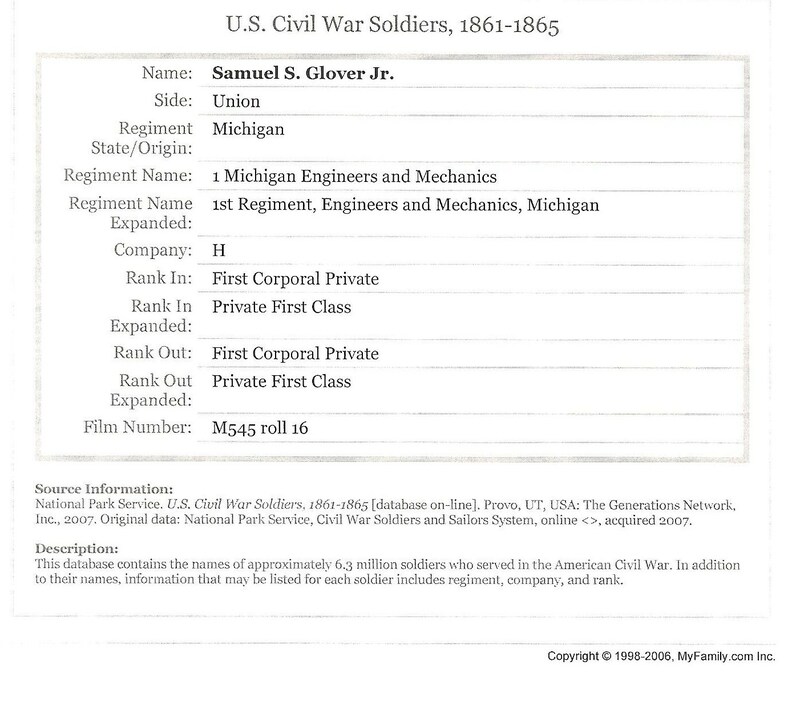 The WDYTYA Matthew Broderick episode motivated me to order my great great grandfather, Samuel S. Glover, Jr, civil war records from National Archives and Records Administration (NARA). I had found his service record at ancestry.com in U.S. Civil War Soldiers, 1861-1865 database. 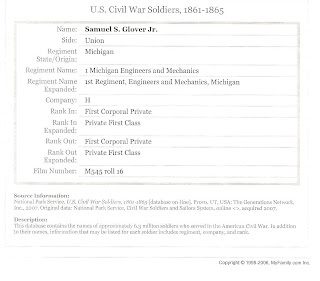 I completed further research and found Samuel S. Glover, Jr civil war pension index file at ancestry.com in the Civil War Pension Index: General Index to Pension Files, 1861-1934. Confident I had the information I needed to order Samuel's records, I headed to the NARA website. I haven't spent much time with this website and had a little trouble navigating to where I wanted to go. After a few clicks, I stumbled onto what I wanted. You should now be on 'Order Reproductions' page. From here you can 1) Get assistance with 'Which Reproduction Should I Order?' or 2) Click on Military Services and Pension Records. I chose Military Services and Pension Records. All prices include shipping and handling. There is a paragraph that explains what is included in each record. I looked over the information and decided to order Federal Military Pension Application-Civil War and Later Complete File (NATF 85D). This is the most I have ever paid for genealogical records, but I figured it was cheaper than a trip to Washington, D.C in order to look them up myself. You will need to select delivery format CD/DVD or Paper. The CD/DVD choice comes in .pdf format. Click to add it to the cart. The more information you can provide the better. Other information includes birth, death, residence, service description, pension file number, and name of widow. There is a spot to include any additional information you have. You can save and finish later, if needed. When finished it will take you to the order and payment information. Once you have submitted the information, you are able to check on the progress of your order. My order took 40 days from the time I submitted it until I received it. I chose the CD/DVD option. I was extremely pleased with the records that I received. I thought the files I received was 91 pages of genealogical magic! I will be posting in the future about my ancestor's file. Have you ordered records from NARA? Please, share your experience, did you think it was worthwhile? The surname Swallow is English in origin. According to ancestry.com and the Dictionary of American Family Names the Swallow surname is thought to come from "a nickname for someone who resembles a bird". It could be locational in meaning from the Swallow river near Lincolnshire, England. I only have one Swallow, so far, in my family tree. Mary Ann Swallow married William G. Dyer sometime before 1838, when their first child, Adda Dyer was born. I haven't spent any time on this line, so I don't consider it a brickwall. Happy 60th Anniversary, Jim and Betty! 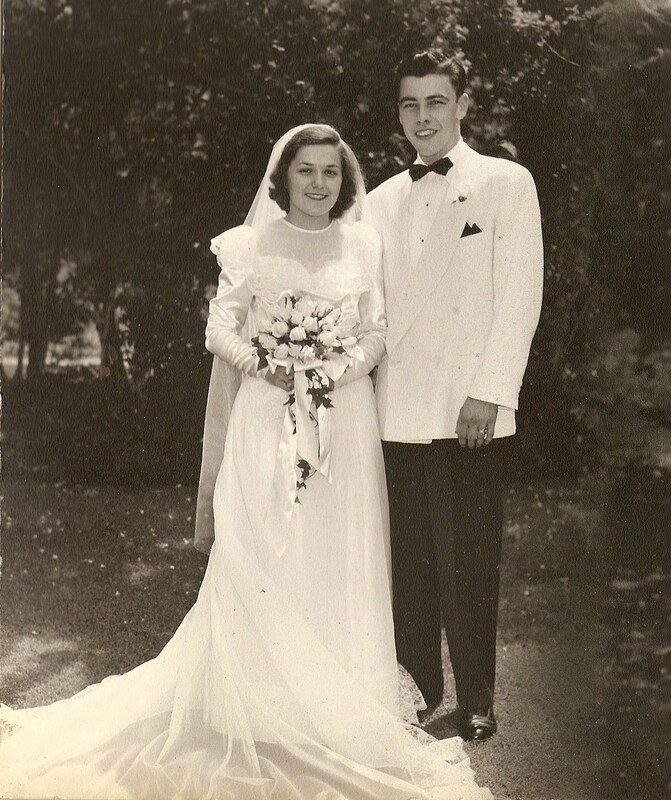 My husband's parents, Jim and Betty Leyndyke, are celebrating their 60th wedding anniversary, today. What a legacy of love they have shown their four children and nine grandchildren. James Marvin Leyndyke and Elizabeth Lorraine Corcoran met in Flint, Michigan in 1949. Elizabeth, known as Betty by friends and family, was visiting her college roommate at the time. Jim's hometown was Flint. Jim and Betty were engaged later that year on a beach in Port Sheldon, Michigan. 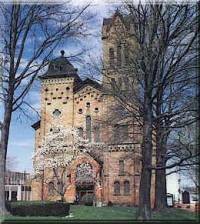 James Leyndyke and Elizabeth Corcoran were married June 24, 1950 at St. Thomas the Apostle Church in Grand Rapids, Michigan. Their wedding reception was held at the Knights of Columbus Hall in Grand Rapids, Michigan. They honeymooned in Northern Michigan and their first home was in Grand Rapids, Michigan on Carlton Avenue. I have known Jim and Betty for 30 years. The first time I met them they welcomed me into their home and have continued to be wonderful in-laws. They are terrific grandparents, too. Jim is a creative, skilled woodworker. He has made beautiful rocking horses, adorable pouting chairs, and even cradles for his grandchildren. He made trains for the boys; and dollhouses for the girls. Betty is a kind, loving, and supportive grandmother. She is a great cook, too. She enjoys family and it shows whenever you visit with her. The family will be celebrating their anniversary with a dinner at Tullymore, in the Canadian Lakes region of Michigan. Our family is truly blessed with the presence of Jim and Betty in our lives. Happy Anniversary, Jim and Betty! The July 1955 Vermont Quarterly published a letter that Orlo H. Fenn wrote to his parents, Daniel and Huldah (Rowley) Fenn, my great-great-great grandparents. Orlo H. Fenn is the brother of my great-great grandfather, Daniel C. Fenn. The letter dated July 1 AD 1932 was sent to his parents in Shoreham, Vermont from Dexter, Michigan Territory. 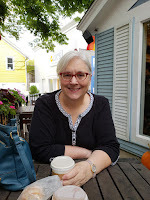 Orlo writes of his trip from Shoreham, Vermont to Michigan. Orlo H. Fenn, with his wife Lois (Lawrence); Truman Lawrence, with his wife Matilda; and William A. Davis 'Arnold', with his wife Abigail (Lawrence) started their journey in Shoreham, Vermont on a Monday. They travelled to Whitehall, New York arriving the same day they left Shoreham. They spent the night here. From Whitehall the group travelled to Troy, New York- arriving on a Friday morning. From Troy they travelled to Buffalo, New York. Orlo states in his letter that they arrived in Buffalo on Saturday of the next week, a trip of twelve days. The group secured passage aboard the steamboat, Ohio, in Buffalo and travelled to Detroit in the Michigan Territory, arriving on a Monday. On Wednesday morning, Orlo writes that Arnold Truman, Matilda and Orlo left Detroit by stage travelling to Dexter. They arrived at a Mr. Spaulding's house on Thursday at noon. The rest of the week was spent looking at land. During this time, Arnold Truman and Orlo Fenn travelled by foot (which took four days) to Lapeer to look at land. Arnold and Orlo decided they would rather settle in the Dexter area. Arnold and Orlo then left for Detroit to buy land at the land office. Orlo purchased 120 acres of land, 9 miles from Dexter Mills. In addition, he bought one yoke of oxen, one cow, and a calf. Orlo H. Fenn's land records can be found at Bureau of Land Management-General Land Office Records. There are three certificates issued: Certificate Numbers 6927, 6928, and 13156. The area that the land was bought eventually became the township of Sylvan, which was organized in 1834. The letter continues with prices paid for livestock, information on planting the land and building homes. He reports on conditions pertaining to life, Indians, and religion. Orlo was living in a barn when he sent the letter as a log house was being built for Arnold (Davis) which they all were going to live in until after sowing, when Orlo planned to build his own. Orlo H. Fenn's family members also settled in the same area. His parents, Daniel and Huldah (Rowley) Fenn arrived in the Spring of 1833. The following brothers and sisters settled in present day Washtenaw County too: Tully C.P. Fenn, Betsy Fenn, Daniel C. Fenn, Aminda Fenn, and Abel Fenn. Orlo H. Fenn's letter home represents early settlers experiences in travelling to the territory of Michigan. I admire the independent spirit and sense of adventure of my ancestors. Fenn Orlo H. "A Letter to Shoreham." Vermont Quarterly (July 1955), p 229-230. History of Washtenaw County, Michigan: together with sketches of its cities, villages and townships,...portraits of prominent persons...and biographies. Chicago: Chas. C. Chapman & Co., 1881. United States Bureau of Land Management, "General Land Office Records," Database and digital images. . http://www.glorecords.blm.gov/PatentSearch/ : 2010. Entry for Orlo H. Fenn Certificate Number 6927 and 6928. Vermont Cemetery is located on Chelsea-Manchester Road, Chelsea, Washtenaw County,Michigan. This plaque is in honor of the pioneer settlers who arrived in Washtenaw County in 1832, they were from Vermont. Vermont Cemetery is the oldest burial place in Sylvan Township, Washtenaw County. The first death in the township occurred in 1835. There was no land set aside as a burial ground. Aaron Lawrence donated a parcel of land for a burial place. Eventually a Cemetery Association was formed and one more acre was added to the cemetery for a total of two acres. 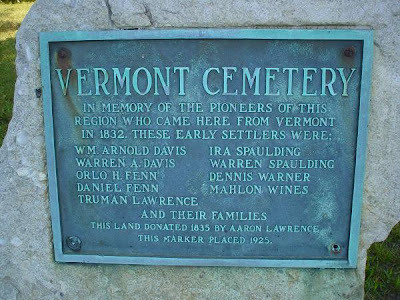 Daniel Fenn was one of the pioneer settlers from Vermont, settling here in 1833. Very little is known about his ancestry. Daniel Fenn was possibly born in Pittsford, Rutland, Vermont about 1787. Daniel Fenn married Huldah Rowley 28 February 1808 in Shoreham, Addison, Vermont. He died 8 March 1836 in Chelsea, Washtenaw, Michigan. The surname Hershberger has been written as Hershberger, Hertzberger, and Herschberger. The Hershberger side of my family arrived in Philadelphia, Pennsylvania, in 1737. Christian Hershberger (1714-1770) arrived on the ship Charming Nancy. His wife, Barbara, and children, Anna and Peter travelled with him. A son, Christian was born in Pennsylvania They settled in Berks County, Pennsylvania. Researching three Christian Hershberger's has been interesting, to say the least. I have confused them a time or two! My maternal grandmother, Daisy, was a descendant of the Graf family. She was born to Valentine and Nancy (Mast) Graf. One of the resources I have found incredibly helpful with my Graf line is Shawn D. Graff's "The Graf Family of Rockenhausen Germany". Shawn's wonderful site gives a brief history of the Graf family and four generations of Graf's on the home page. There are separate pages for the seven descendants of Johann Caspar Graf and Katarina Margreta Philipp. Additional pages include: links, summary of website creator and how he fits into the Graf family, obituaries, and pictures. Shawn has pages of pictures that have names attached to them and he also has pages of unknown Graf's, which he asks for help with identifying. I have contacted Shawn with questions and he has generously given me the information I seek. His information is taken from many Family History Center microfilm records, many from Rockenhausen, Germany. Although his site isn't sourced, anytime I asked for the information, he was able to provide it. 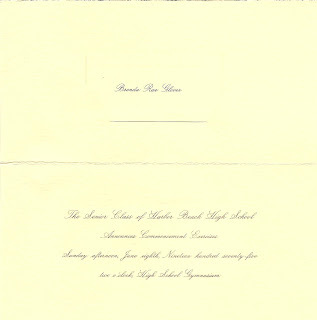 Thank you to The Family Curator-June Blogger's Almanac for the writing prompt on June weddings. June is one of the most popular months to get married in. This tradition came about in Roman times. June was the month dedicated to worshipping Juno, the Roman Goddess of marriage. June couples felt their marriage was deemed lucky and blessed by the Gods. They believed they were destined for happiness and prosperity if they married in June. Another take on the popularity of June weddings is that if a couple were married in June, then they could conceive a child and give birth before the harvest season. The wife would be able to recover from the birth and be of help to the family. Nothing like getting the most out of your new bride! Another more absurd idea came from the medieval era, it was believed that a June wedding was held because they had their yearly bath in May and would still be "clean" in June. Wedding bouquets would mask any smell. The idea of medieval yearly baths has since been proven false. 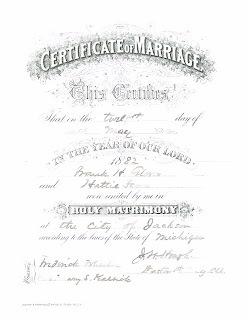 Do you have June weddings in your family history? As they say in the song, 'June Brides' from "Seven Brides for Seven Brothers"- Oh, they say when you marry in June, you're a bride all your life. Today is Flag Day. Are you flying your American Flag? Flag Day is celebrated every June 14th in the United States. It commemorates the adoption of the U.S. Flag. President Woodrow Wilson, in 1916, was the one to officially adopt June 14 as Flag Day. You can see many flags flying at the entrance to Fort Custer National Cemetery, Augusta, Michigan. The avenue of flags at the cemetery is awesome. 152 flagpoles are located along the main entrance to the cemetery. Another 50 flagpoles are arranged in a semi circle and used for special occasions. The flags are flown Easter through Veteran's Day, weather permitting. Does your community celebrate flag day with a parade or other festivities? I hope you are flying your flag proudly this Flag Day. I know I am. 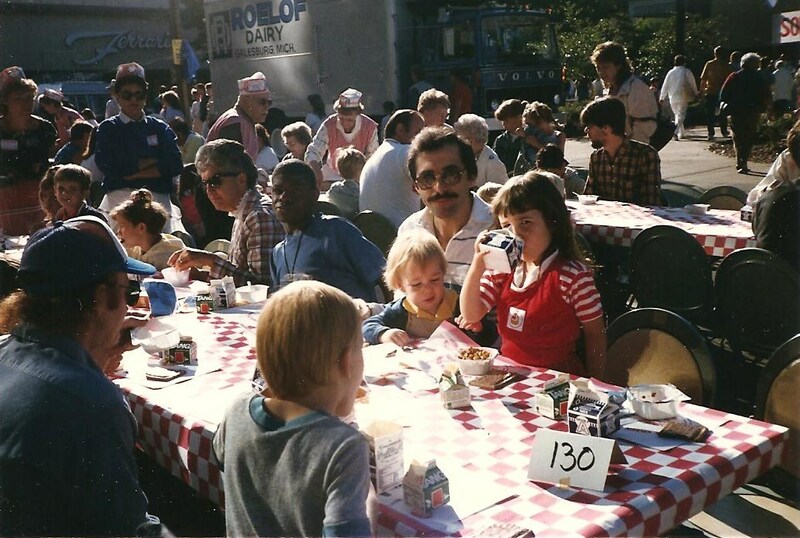 Within weeks of moving to Battle Creek in 1988 we experienced our first Cereal Festival. Battle Creek, Michigan is home to the World's Longest Breakfast Table. This free breakfast of cereal, pop tarts, tang, banana's, and milk is served every year on the second Saturday of June from 8-10am. Today! The World's Longest Breakfast Table is part of the Battle Creek Cereal Festival. This festival celebrates the history of cereal in Battle Creek. A parade, entertainment, educational vendors, activities and lots of fun makes up the festival. Join Tony the Tiger, Snap, Crackle, and Pop, Toucan Sam, Flintstone Characters, and others for a day of free breakfast and fun. 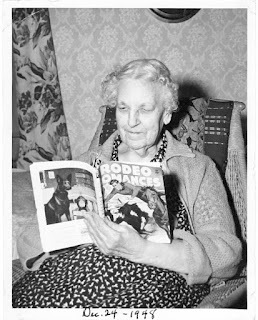 My paternal great grandmother was known as Hattie in every record I have found. I have always wondered if that was her given name, or if she was possibly named Harriet and used Hattie. Hattie L. Fenn was born during the civil war, June 1863, in Michigan. 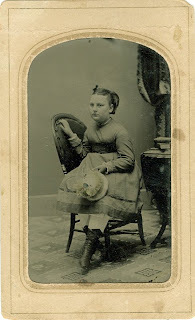 Hattie was the youngest of five children born to Daniel C. Fenn and Elizabeth Ann Poore. Her siblings were Zealton, Tully, Osphie, and George. She had a half sister, Estella, who was born to Daniel C. Fenn and Jane E. Poor (Elizabeth's sister). Although I don't have proof positive of where in Michigan Hattie was born, I have a tax list for the year 1863 in which Daniel C. Fenn was taxed in Sylvan Township, Washtenaw, Michigan. The first federal census that Hattie is found in is the 1870 census. The family is living in Jackson, Jackson, Michigan. Included in this census is Daniel C. Fenn, Elizabeth, Zealton, Tully, George, Hattie, and Ellen Poor (Elizabeth's sister). Osphie Fenn who was in the 1860 Census, at age 1, is not included in this census. According to Hattie Fenn's bible records, her father, Daniel C. Fenn, died in February 1873. Hattie would have been almost 10 years old. Sometime before 1880, Hattie moved in with her sister's family: James and Estella Shaw. 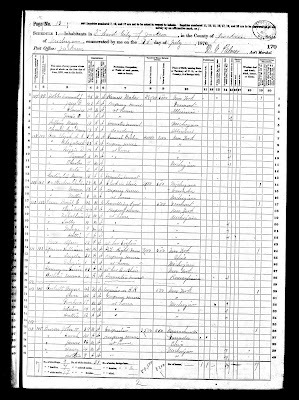 The 1880 Federal Census for Jackson, Jackson, Michigan shows Hattie, age 17, working in a corset factory. Jackson, Michigan was a city known for its corset companies. In 1868, The Bortree Company moved to Jackson, Michigan and became the first corset company west of New York City. Other corset companies set up business and by 1900 sixteen corset companies were doing business in Jackson. Although I don't know which factory Hattie was working in I know Hattie was working during a time that was notorious for long hours, low wages and hazardous working conditions. Plus, women were known to have made a fraction of the wages that men made at that time. 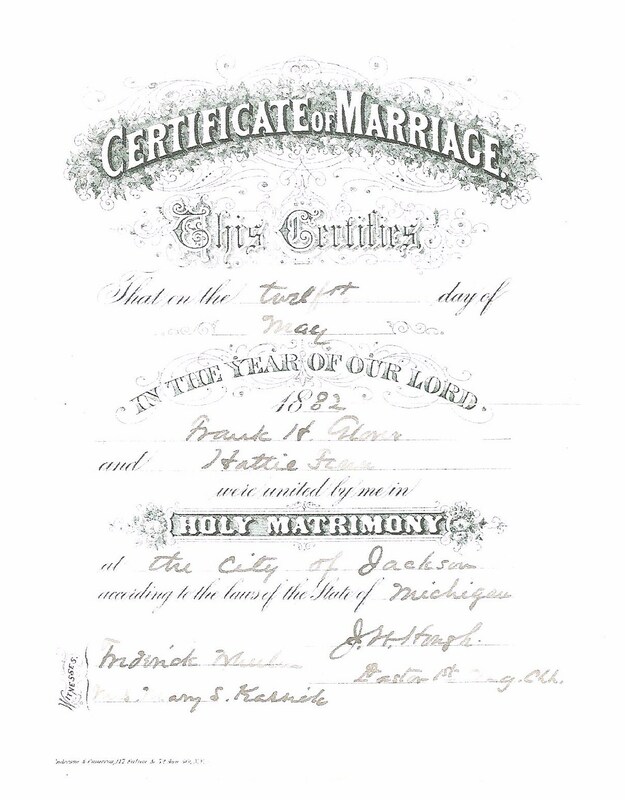 Hattie L. Fenn and Frank H. Glover were married on 12 May 1882 in Jackson, Jackson, Michigan. Rev. JW Hough, Pastor of 1st Congregational Church Officiated. Hattie lived her whole life in Michigan. 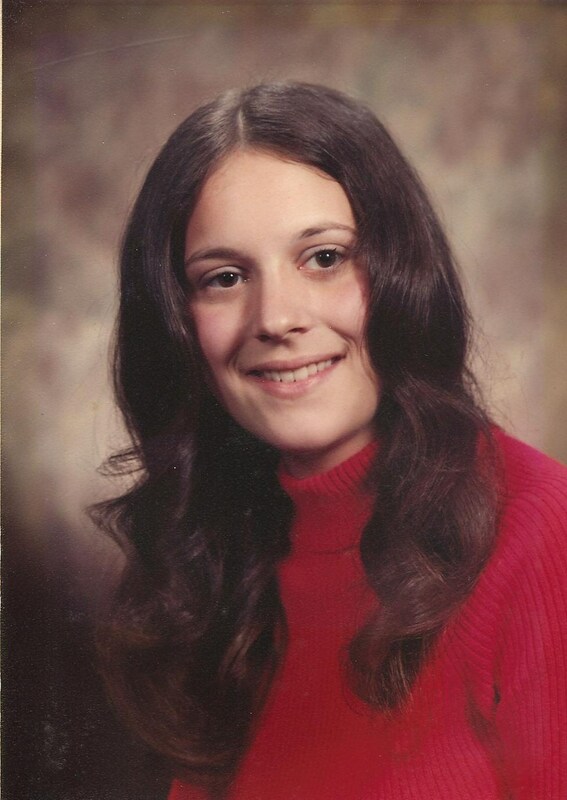 While married she lived with her family in Crystal Lake and Marquette. Sometime after her husband, Frank, died (in 1925) Hattie went to live with her daughter Adeline. Adeline E. Glover married Victor Tyson and lived in Battle Creek, Michigan. 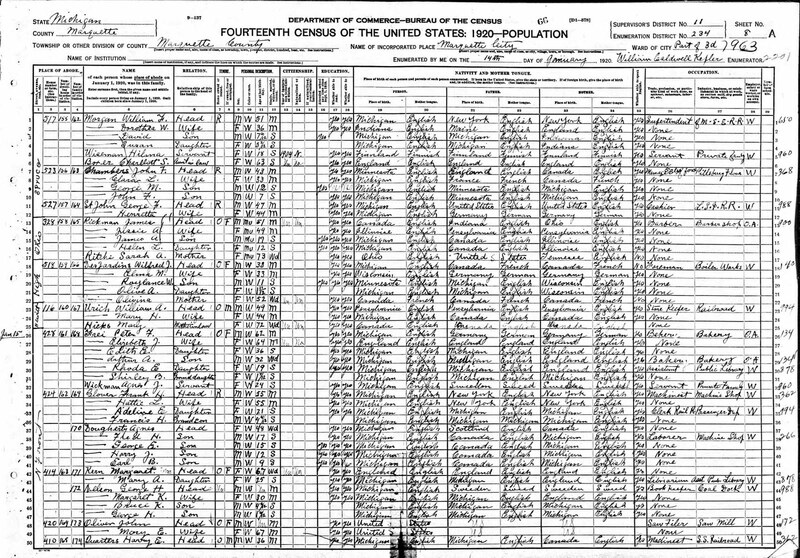 The 1930 Census lists Hattie living with the Tyson's. My father remembers visiting Hattie in Battle Creek. He remembers his visits to Gougac Lake, which Hattie lived near. The street, Lake Ave, is no longer in existence. But, it was within walking distance to my current home, as I live in Battle Creek. Hattie continued to live with the Tyson's for many years. Around 1950, she went to Munising, Alger, Michigan to live with her son, Claude R. Glover. Hattie L. Fenn Glover died 14 December 1951 in Munising, Alger, Michigan. She is buried at Park Cemetery in Marquette, Michigan. The grave site is in Section U across from a beautiful pond area. 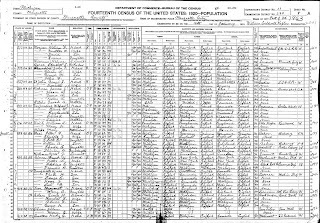 This is the 1920 U.S. Federal Census for the Frank H. Glover household in Marquette, Michigan. The people and relationship listed include: Line 33-Frank H. Glover, Head; Line 34-Hattie L., Wife; Line 35-Adeline E. , Daughter; Line 36-Francis H., grandson. One might assume that Francis H. is the son of Adeline E. from this record. This is not the case. Francis H. Glover's birth certificate, which I have a copy of, further complicates things. 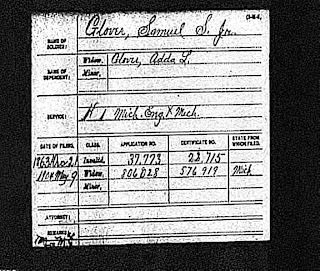 His father's name is listed as Frank Henry Glover. For some reason unknown to me, my grandfather, the Frank Henry Glover on the birth certificate, used this name at various times. His legal name given to him at birth was Harry Glover. Francis Henry Glover was born 12 September 1915 in Detroit, Michigan to Harry Glover and Emma Winkler. Emma Winkler Glover died just 15 days later on 27 September 1915. 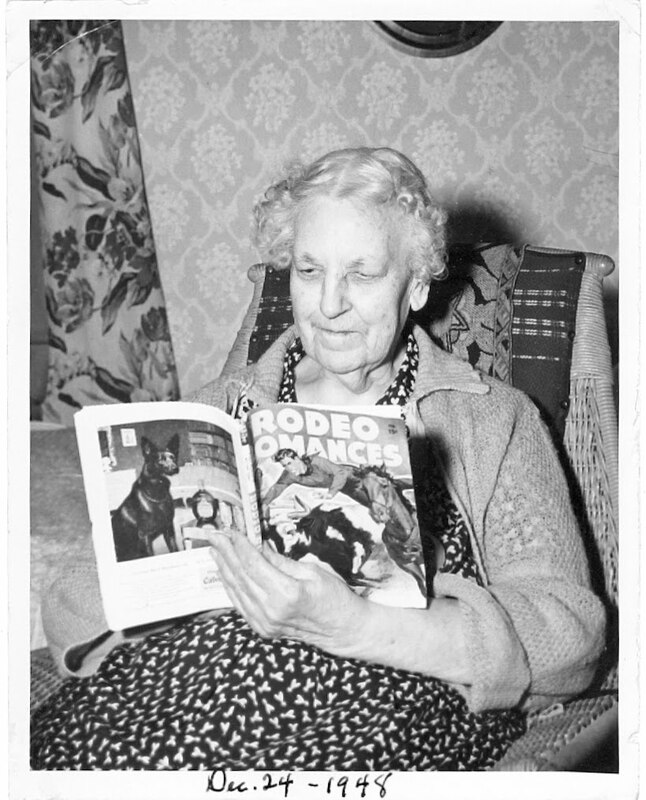 Francis also known as Hank, went to live with his grandparents, Frank H. and Hattie L Glover as an infant. He lived with them until he was 12 years old. At this time he went to live with his father, Harry Glover and his second wife, Sarah Lilla Watt. 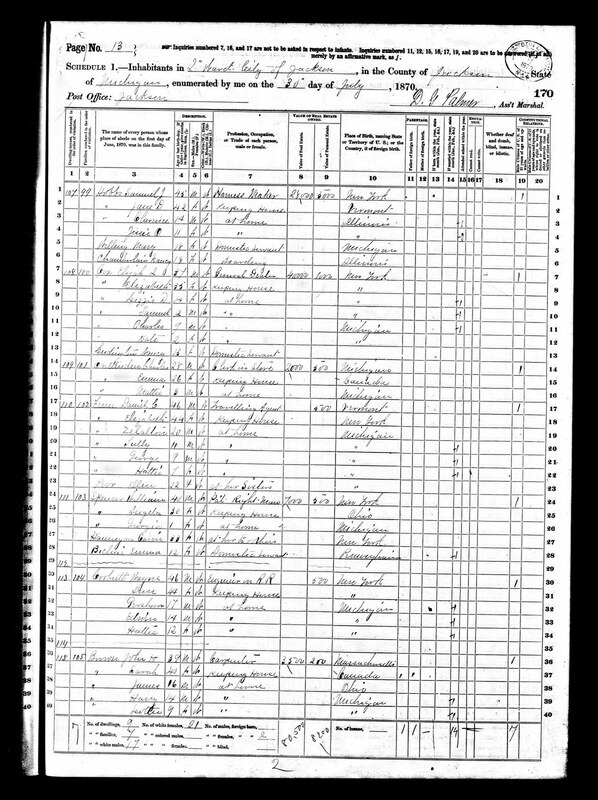 In conclusion, Adeline E. Glover in this census is 'Aunt Addie', not Francis H's mother. 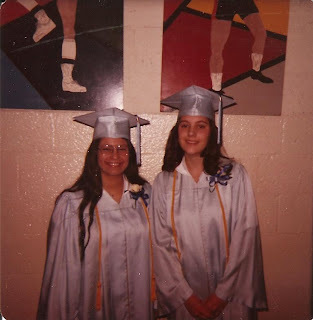 June 8, 1975, my high school graduation day. 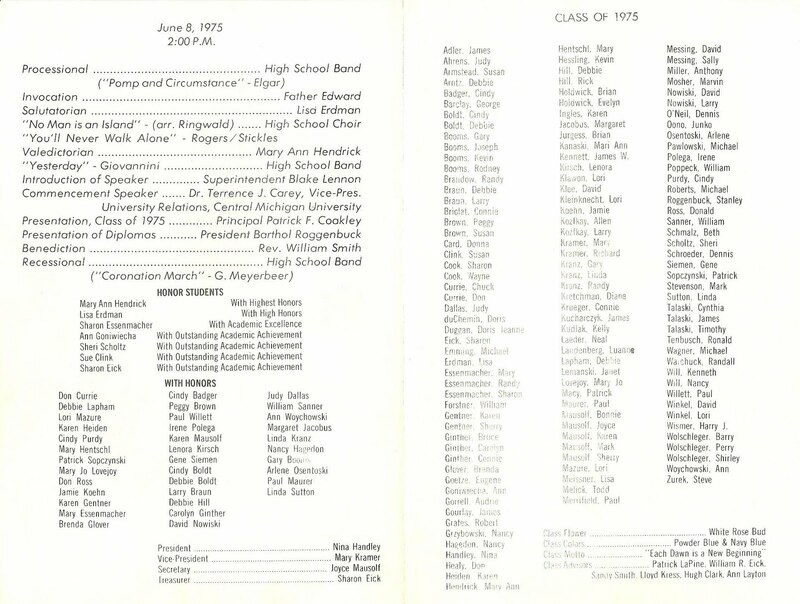 I graduated from Harbor Beach High School in Harbor Beach, Michigan. It is hard to believe it has been 35 years. What I wouldn't give to have my dark hair still! I remember high school with fondness. 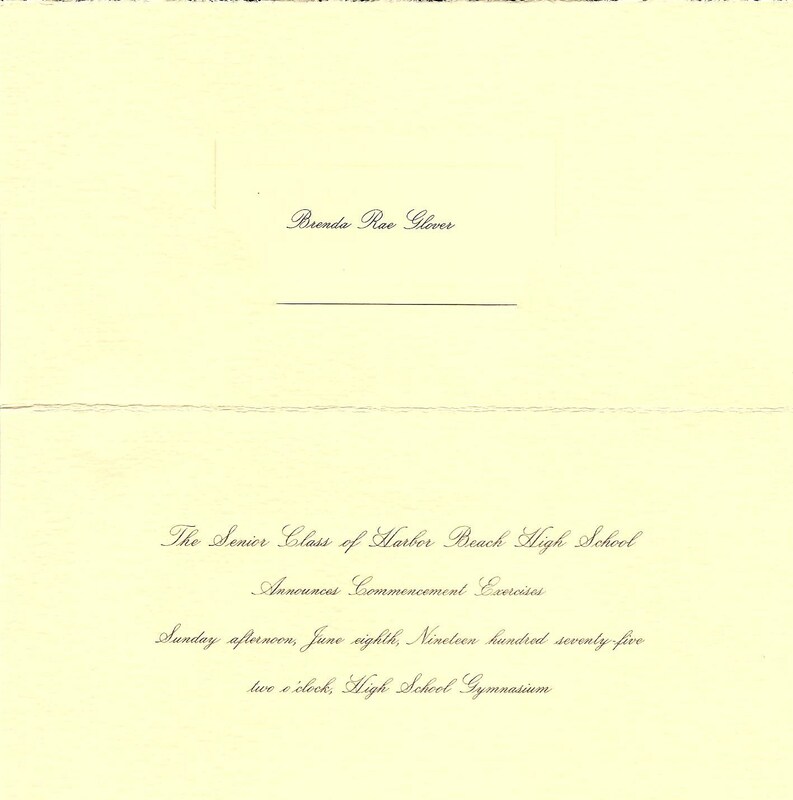 In high school I was involved in National Honor Society and Student Action for Education (formerly known as Future Teachers of America). I played on the Junior Varsity girl's basketball team for one year. I worked on the stage and costume crew for the school musicals. Graduation Day was a beautiful, sunny June day. 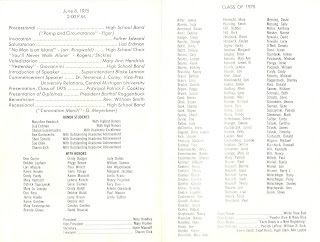 Graduation ceremonies were held in the Harbor Beach High School gym. Mary Hentschl (on left) and me on graduation day. Mary knows me like no one else. We were good friends in high school. We worked at the Harbor Beach Resort as waitresses in the summer during high school. Mary and I went to Western Michigan University in Kalamazoo, Michigan in the fall of 1975. We were roommates our freshman year, and suite mates our sophomore year. We were in each other weddings. We are still friends today. Mary lives in Parchment, Michigan now which is about 30 miles from where I live. The surname Rowley is Anglo-Saxon in origin. Rowley refers to various places in England. It has been written as Rowley and Rowlee. The Rowley side of my family arrived in the United States in 1632 coming from England. Where Can You Find the Largest Monument to the Underground Railroad? The nation's largest monument to the Underground Railroad can be found in Battle Creek, Michigan. The 28 foot long and 14 foot high bronze statue was made possible by the generosity of the WK Kellogg Foundation and Glenn A. Cross Estate. Sculptor Ed Dwight's monument can be found near WK Kellogg's House, entrance off of W. Van Buren Street. The lovely park like setting with flower-lined pathways showcases the beauty of the statue. A information kiosk is on site to provide further information. This statue honors the men and women who operated the Underground Railroad. Specifically, Harriet Tubman and Erastus and Sarah Hussey. Harriet Tubman, best known conductor of the Underground Railroad, travelled the country helping slaves, but never came to Battle Creek. Erastus and Sarah Hussey were local conductors of the Underground Railroad. Erastus Hussey claimed to have helped 1000 slaves as they passed through Battle Creek. Battle Creek, Michigan was one of the underground railroad stops that fugitive slaves used on their way to Canada. The statue depicts scenes of families escaping by horse drawn wagon, moving through a forest and seeking refuge in a cellar. During the 1840's and 1850's historians estimate that 1500 fugitive slaves passed through Battle Creek. If you are ever in Battle Creek, add the Underground Railroad Monument to you list to see. And if the jeopardy answer is 'you will find the largest monument to the underground railroad here' You can say, "What is Battle Creek, Michigan?"